“We were four friends in a café…”. I steal the famous Gino Paoli’s lyrics to tell you the excitement and the typical nostalgia for a dive into the past that my participation in the workshop “Pizza Preview” of Napoli Pizza Village on future trends of the Neapolitan pizza gave me. We were more than four friends (Antonio Pace, Gennaro Giustiniani, Gaetano Fazio, Gaetano Esposito, Sergio Miccù and me), we were not in a café but seated in front of a wood-burning oven, dreaming of bringing the Neapolitan pizza all around the world. 21 years have passed and now our dream has come true! In 2016, the Neapolitan pizza is the best ambassador of our city, but, at that time, maybe, it was not quite known even in Caserta! 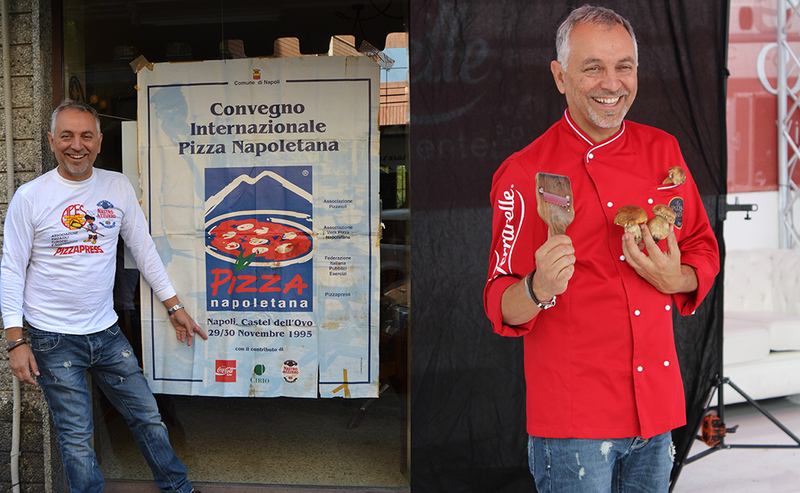 In November 1995, we organized the first convention at Castel dell’Ovo to support the drafting of the disciplinary of the authentic Neapolitan pizza, in collaboration with “Seconda Università degli Studi di Napoli” (Professor Carlo Mangoni di Santo Stefano). Two years later, on September 15, 1997, at Maschio Angioino we presented the text to the press and the insiders and in the evening we started the first edition of Pizza Fest using four prefabricated ovens (the “father”, undoubtedly, of today’s Pizza Village!). I remember that when the event ended, when people had already left the stalls to come back home, we pizzaioli cooked pasta and potatoes and Ischia-style rabbit in the wood-fired ovens… what wonderful times! Something magical, the spirit of dreamers, the essence of being united by the same idea, the same project. Accepting the invitation from Napoli Pizza Village organisers to take part in the workshop “Pizza Preview” I had the impression of being immersed, for a moment, in that atmosphere, full of hope, in which our destiny was in our hands, our heads, our hearts… In front of an attentive and a specially-selected audience, I presented my ideas condensed in my two pizzas: pizza “Notizia” with Crovarese tomatoes, datterini tomatoes from Agro Nocerino-Sarnese, which we are now recovering thanks to the cooperative Gustorosso Dani Coop work, porcini mushrooms, smoked buffalo mozzarella and extra virgin olive oil, always been on my menu, and, at this point, the popular pizza Capodimonte, with San Marzano tomatoes “a pacchetelle”, buffalo mozzarella, buffalo sausage from Alba Consortium, pepper, pecorino romano cheese and extra virgin olive oil PDO Colline Salernitane, which was included in the list of pizzas that my pizzeria “La Notizia” offers four years ago to support the restoration of the panelling created by the Neapolitan sculptor Vincenzo Gemito. Don’t you thing that these pizzas are “new” enough as proposals for the future? Well, I bet that in the field of pizza, as well as – and even more – in the fashion industry, will count more and more the simplicity. Tomorrow’s pizzas will have a low calorie count, they will be simple but flavorful.